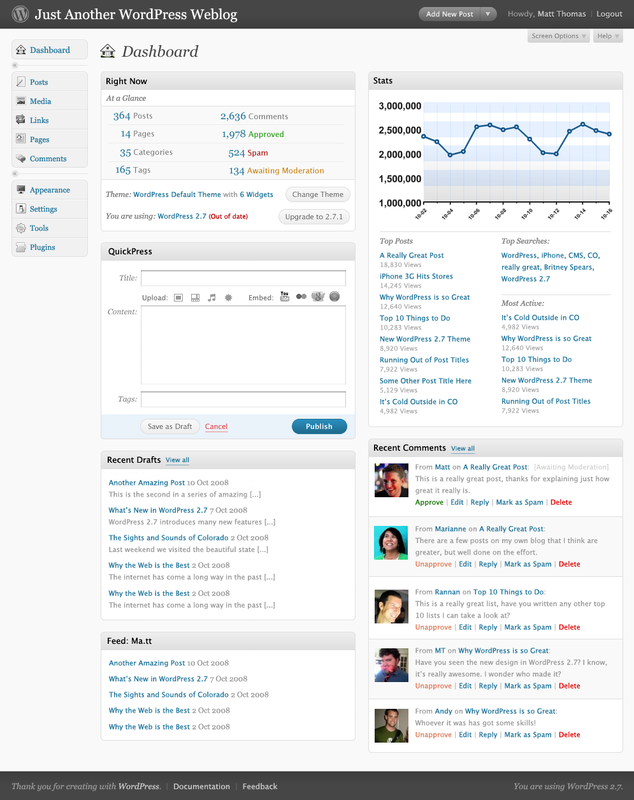 WordPress 2.7 is going to be another huge improvement of our favorite blogging software. This new release will include important changes, especially with the comments. To tell the truth this point of WordPress has in my opinion been neglected in the latest releases, but the next version will definitely get WordPress back on track. In this latest release you will be able to have threaded and paged comments, like on Digg. Well, you got it by yourself, that means a bit of work for developers while adapting your own WordPress theme to the new comment system. Can you do that? Yes, thanks to the great tutorial by Otto! Justin Tadlock has also proposed us a method to create a WordPress 2.6 and 2.7 compatible theme! The admin panel has been redesigned once again. You can already have a look at it in this WordPress blog post by downloading WordPress 2.7 Beta version, or have a look at the wireframes that were used as a base for the redesign work. You can also log in to the WordPress test blog and see for yourself: the login name is admin and the password demo. As you can see the admin navigation menu will be located on the left side in the next version. We can also notice the introduction of colors and new icons that make this admin panel a little bit more alive than before. This new organization also gives you more space to write and manage your blog, as the menu bar can be minimized easily. That is another huge improvement with this WordPress 2.7 release, you can download and install plugins without ftp client or even the WordPress plugin directory. Along with WordPress 2.7 the ability to use keyboard shortcuts to browse and moderate comments was introduced. Here is a summary for all these shortcuts. And some others I have forgotten! If you have any opinion or information to add to that article feel free to comment! And if you want more information about the upcoming WordPress releases subscribe to the RSS feed!